I'm getting good at steering with the stern rudder under heavy winds. As luck would have it my kayak turns fairly slowly towards the wind. On moderate heavy winds (a decent number of whitecaps) every 8 stroke pairs or so I apply a stern stroke to keep in course. Under stronger winds (more whitecaps) I would do it after every 3 or 4 stroke pairs. I like the rudder stroke because it is less tiresome than turning strokes, which feel like you are constantly fighting the kayak. It allows me to keep a nice cadence, and let me take micro breaks which are sorely needed (pun intended) after an hour into the wind. The only problem is that it slows down the kayak. The slower the kayak goes, the less stable it becomes in choppy waters, and the harder it gets to control. I'm also about to build another Greenland paddle, one a bit longer and narrower. Based on my current paddle, I think that my sweet spot is on that direction. I'm also hoping that a longer paddle will make the rudder stroke a bit more efficient. What do you think? At times the choppy waters were coming at a bad angle. At that particular moment leaning did not feel like a good idea, specially when you consider that I can't roll my kayak (yet). What do you mean my trimming? Trimming is adjusting your seat fore and aft and/or adding or subtracting weight to the bow or stern area. I will try to remember that leaning is a bad idea in rough conditions I hope you at least have flotation in your boat and can do a wet entry. You may want to get the video "Beyond the Cockpit" by Wayne Horodowich. On the conditions I was, shifting my own weight around was having little effect. I did have flotation bags plus the already inflated paddle bag. Leaning on my kayak is rather peculiar. I have an Arfeq (MontBell) Ellesmere 480 (15.75'x22.88"), a friend has the Ellesmere 530 (17.4'x24"). On the longer Ellesmere, on calm waters, I can get speed, lean, and the kayak will begin to turn nicely. On my shorter kayak, leaning does not lead to turns anywhere as readily. It is, however, very responsive when it comes to speed+hard lean+sweep stroke. The single seat Ellesmeres are just like brothers; same family and blood, different temperaments. On the flotation bags, I need to find a larger one for the front. Previous flooding tests suggested that the front could use more buoyancy. I did take some efforts to fully flood the kayak, but once flooded to 100%, the nose sunk significantly more than the back. The other thing is that I'm having problems convincing my new paddling buddy that we should practice recovery skills in the conditions we are most likely to need them, namely wind-whipped surf and big ocean swells. DN wrote: Leaning on my kayak is rather peculiar. I have an Arfeq [snip] a friend has the Ellesmere 530 (17.4'x24"). On the longer Ellesmere, on calm waters, I can get speed, lean, and the kayak will begin to turn nicely. lean+sweep stroke. The single seat Ellesmeres are just like brothers; same family and blood, different temperaments. Shorter boats sweep more easily than longer boats, OTBE, because the shorter boats offer less resistance to rotation. In the language of physics, they have a smaller moment of rotational inertia. No surprise your boat sweeps more easily. On the turn in response to lean: I assume the boat turns away from the lean: if you put the boat on its starboard side, it turns to port, yes? This is more pronounced for boats with more rocker. Does your boat have more pronounced rocker than the shorter  one? If so, that is why it responds better to leaning. BTW, I'll second Tsunamichuck's advice: you need to read a good primer on bracing, paddle strokes, and turning. We can't do as good a job passing on that info piecemeal as you will be able to do for yourself by reading a coherent explanation/tutorial on these subjects. An example: Tsunamichuck leans like crazy when he paddles rough waters. If you are reluctant to lean in rough waters, then you have a lot to learn about paddling rough water, and should stay off it until you have some good bracing skills, and the other skills needed in rough stuff. Last edited by krudave on Thu Aug 23, 2007 8:44 am, edited 1 time in total. On the turn in response to lean: I assume the boat turns away from the lean: if you put the boat on its starboard side, it turns to port, yes? This is more pronounced for boats with more rocker. Does your boat have more pronounced rocker than the longer one? If so, that is why it responds better to leaning. What I was trying to say is that the longer boat responds better to just leaning. On calm waters, if I bring both boats to speed, pull the paddle off the water, and lean, the longer one will begin to form an arch. The shorter one (mine) keeps on going on a more straight line. When it comes to lean and sweep at speed, the shorter boat is more responsive. I'm remarking this because while both boat look similar, the longer one is not just an elongated version, but a different beast altogether. This is more obvious when you put the bones side by side without the skin. I have been doing that. For paddling techniques I have been watching Nigel Foster's kayaking series, which goes into great detail on the basics and a bit beyond. He explains why a kayak does what it does under wind, and the different ways to compensate. After playing in the wind and finding something that worked for me I just wanted a second opinion. DN wrote: while both boat look similar, the longer one is not just an elongated version, but a different beast altogether. This is more obvious when you put the bones side by side without the skin. If they look similar but are different beasts, then something subtle is going on. 1. More upward curvature of the hull, fore to aft (= rocker) on the one that turns when leaned. 2. More pronounced keel at the ends for the one that does not turn so readily. 3. A more flexible frame for the longer one. When weighted in the water by your body, this will generate more rocker (see above). BTW, you did not say which way the boat turns if you lean to starboard. Does it turn to port? I did have flotation bags plus the already inflated paddle bag. The paddle-float doesn't count as flotation. When you need flotation - you need it IN the boat. When you need a paddle float - you need it OUT OF the boat. If you need either you will often need both. Neither "sink" nor "swim" is a good result for kayaking skills in rough conditions - listen to Dave and Chuck. They've done the time to know what they're saying. For the most part I stayed upwind from the beach. Worst case scenario it would had been an annoying (wind/wave assisted) long swim towards shore. Wind has very little effect on a swimmer. Current is what you have to worry about. If you're paddling in non-tidal waters this is irrelevant. If the waters are tidal you need to know what the current is doing, and where it will bring you when you swim. First of all, I must say that the concern is appreciated. Trust me; I’m taking into consideration everything that is being said. 1. You lean on starboard, it turns to port. The Nigel Foster videos are excellent to cover the basics and to get rid of bad habits before they begin to form. I will keep on watching them for quite a while. The more I understand, the more I get out of them. 3. Wind has little effect on a swimmer, but all the wind generated waves do. 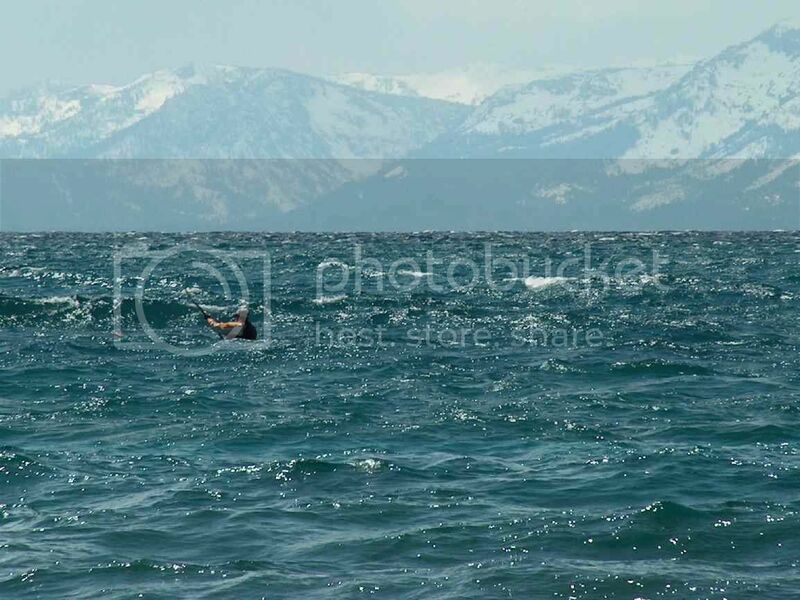 It is a lot easier to swim with the waves that against them, especially if one is trying to tow a kayak that is being pushed to shore by said winds and waves. When I do my risk assessment I take into the outmost consideration my personal safety, followed by gear safety, and last and least grief. While in the windy/rainy/choppy lake, a recurring thought was ‘what would I do if I go under’. The waters were warm, I could use the practice, and if push came to shove, I would have been able to work my way to shore. Lots of grief, but 200 meters from shore while pulling on a kayak that is being pushed there, I think there is very little risk to life and limb. If the winds were blowing in the opposite direction (5 miles to the next shore) it would had been stupid to even try. First of all I would have not been there, but at that point (provided I could not get back in the kayak) I would had let go of the kayak, make my way to shore, and gotten back to recover it on a power boat. Again; actual risk to life and limb would still be very low, some risk to gear that could be mitigated by preparation and by keeping an eye on the weather, and above average potential for lots of grief. By far my biggest concern was not to importunate somebody else with my foolishness. Even in that weather the sight seeing boats were going about. I was afraid that if I went down that they would send somebody to ‘rescue’ me. I rather spend half a day swimming to shore (which gives me plenty of time to ponder what went wrong) than to importunate folks on something that was my own fault. That was by far the highest motivation to stay afloat. DN, have you practiced using that paddle float to self-rescue? There is no need to swim/tow a kayak any distance if you can self-rescue. I have no intention to swim if I can help it. I practice self rescue just about every time I go out in calm waters. I have no problem self rescuing in calm waters with the float, and have a decent level of success without the float (again, calm waters). While I have every reason to believe that I can self rescue on a certain amount of choppy waters, until proven otherwise, for risk assessment purposes I'll assume I can't and be happy when I prove myself wrong. DN, sounds like you are on your way. Get that self rescue nailed down in rough water and you'll be good to go. There seems to be a lot of advice here already (and they are the ones I would have refered you to, anyhow); I have nothing more to offer than my own approach to the original problem: weather helming. If your boat points into the wind too easily, try purposefully placing heavier items behind you. If you over do it and the boat starts to point downwind too easily, move some of that ballast forward again until the boat seems "balanced" i.e. not overly inclined to point upwind or downwind. Keep in mind that some consider a slight weather helm to be desirable as it will keep the boat pointed into the wind if left to its own devices and not catch you with a surprise beam wave. Heavy weather like this is one of the reasons I like to have a rudder. A rudder isn't for everyone, but I like the amount of effort saved in keeping the boat tracking for long distances. For tight turns I can't stand having a rudder.